Europe's top banks may have survived a milestone test of their resilience but strengthened balance sheets count for little when they generate such meagre returns compared with US rivals, investors say. The European Banking Authority stress test results on Friday showed the sector in reasonable financial health. The results showed a clean sweep of 48 lenders judged capable of withstanding economic shocks like a crash in property prices or bond prices. However European Central Bank vice president Luis de Guindos said a dozen banks that came below the 9% threshold in the adverse scenario should strengthen their capital positions. 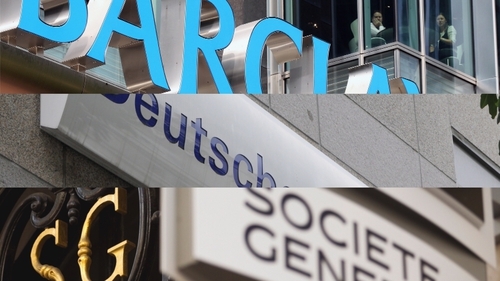 Those banks include Deutsche Bank, BNP Paribas and Societe Generale SOGN.PA. Fears of fresh cash calls partly explain why investors are still running shy of the sector. The STOXX European banks index, which has tumbled 20% so far this year, held flat today following the results. This rejection looks set to continue as Europe's economic prospects darken, according to some fund managers and analysts. A decade on from the financial crisis and despite years of central bank stimulus, Europe's growth is slowing, with economists polled by Reuters forecasting full-year GDP growth in the euro zone of 2.1% this year and 1.8% next. That reflects an outlook depressed in part by Italy's political crisis, the slowdown in Turkey and the likely fallout from Britain's divorce from the European Union, which were all factored into the stress test scenarios. On the surface, European bank stocks look like bargains. The sector's valuation via the STOXX bank index is hovering just above all-time lows, long after lenders shed the toxic assets that destroyed faith in the financial system in 2007. Low base interest rates - 0.75% in Britain and -0.4% in the euro zone - are forcing lenders to cut margins and take greater risks as demand for loans slows amid stagnant growth, resulting in paltry returns for investors. EU banks' average return on equity in 2017 stood at 5.6%, just over half the 2007 level of 10.6%, according to data from the European Banking Federation and below the 9% recorded by US peers. US lenders' investment banking businesses have increased their market share at the expense of their European rivals, thanks to weaker markets and tougher regulations in Europe, and laid bare in much more impressive operating margins - a key measure of profitability - for the US banks. The top US banks' equities and fixed income businesses ran at margins of 31% and 42% in the first half of this year, according to data from Coalition, compared with 14% and 27% for the same businesses in Europe's biggest investment banks. The biggest two buying signals for investors in banks are an uptick in interest rates, followed by growth in demand for debt. But both of these factors are in the hands of policymakers, not bank CEOs. Long-awaited rate rises will come, but those who jumped back into European bank shares in February, when hopes of a shift in monetary policy last peaked, have been punished with a 20% fall in prices. Higher debt costs could also prove fatal to a glut of so-called 'zombie firms' - companies struggling to cover borrowing costs on current profit levels. Forbearance - the act of turning a blind eye to a faltering loan - and 'zombie companies' are most apparent on Italian and Spanish bank balance sheets. Expenses at Barclays' investment bank, for example, continue to spiral, leaving the bank short of its target to cut group cost to income to under 60%. Standard Chartered's Finance Director Andy Halford said his bank had made "virtually no progress" on reducing costs this year in a leaked staff email last month. And promises of 4, 5 and even 6% annual dividend payouts are not luring investors either, because European utilities, telecoms and insurers can offer the same dividends at reduced risk, fund managers said. Banks are the second cheapest sector on a price to earnings basis, trading at 9.1 times consensus estimates on 2019 earnings, a 30% discount to the market while offering a estimated 2019 yield of 5.7%, Berenberg data shows. Only the car sector is cheaper.